So beautiful! I love the picture in the ornament. It feels like you could jump right in. awww so cute!!! 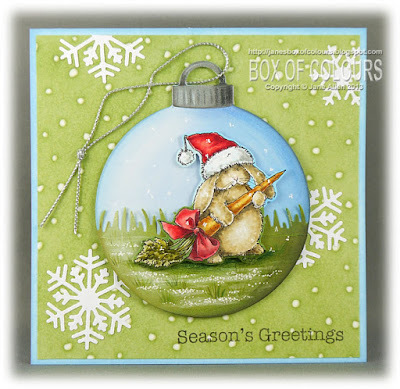 hehehe i love this cutie pie rabbit and what a great idea creating a little bauble... it looks amazing! Adorable! Love the image and it really shows good against the green DP. Please could you drop me an e-mail at mpfox1@btinternet.com I have tried to send an e-mail to you twice but it has failed to deliver on both occasions and I can't find any other way to contact you.Thanks look forward to hearing from you. Where3 you been?? ok where I've been right lol! That thud you heard was my jaw dropping again... fabulous my friend! Jane, this is beautiful, love the bunny fur coloring and of course all of your coloring is always gorgeous. Beautiful card as always. Such a cute, gorgeous card. Such an adorable Christmas card, Jane! 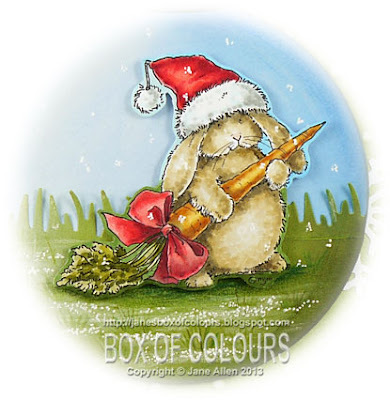 I love how you've coloured in that cute wabbit! A gorgeous card hun, you're very organised!! Putting the little furball on the bauble was such a cute idea Jane. This is a wonderful card for your Christmas stash. Hugs! totally adorable I love this so much. FABULOUS love the image very vintage and you have colored it with perfection, if you did that on a real ball it would be dynomite :):) thanks for sharing this fabulous creation for whatever, won't let myself think of that LOL.. You're very smart to make them ahead..
Love this Jane! So cute and love the layout. I really must get myself organised a bit sooner this year too!